I was passing through Seattle yesterday and had a couple hours to kill, so over a span of two hours, I did my own mini coffee crawl, hitting three different cafés. For the record, I really like Seattle. It seems quite a bit larger than Portland, in a good way. The city is so hilly that from lots of the intersections downtown you can see out across Puget Sound and over to the Olympic Peninsula. These views make Seattle seem more open than it otherwise might be. The first stop of my coffee junket was at Cherry Street Coffee House. Cherry Street has several different cafes in Seattle, but the one I visited was actually on Cherry Street (the original, perhaps?). One of the reasons that I went to Cherry Street was that I had read that the café’s coffee was roasted by Dillano’s, Roast Magazine’s 2010 Roaster of the Year. I ordered an espresso and went to sit down. The café itself has two levels. The coffee bar is at street level, and the seating is down a set of stairs, where the café spreads out under the store next door. It reminded me of an old speakeasy, one of those secret places where people could gather discretely to buck the rules of Prohibition during the 1920s and 1930s. On one wall, rather, in one wall, a walk-in safe serves as the café’s office, and toward the back of the seating area, a faux fireplace is painted onto the wall. Two old, bright red stuffed chairs sit in front of the fire, welcoming you to sit down. With no windows in the seating area, the café is a bit dark, but it suffices as a place to work and drink coffee. The espresso was made from the Cherry Street House Blend, and is unique to Cherry Street cafés. The barista told me that it was a medium roast, but if that’s the case, I have to question my understanding of what a medium roast is. The coffee in my cup had a nice thick crema that stuck to the sides of the cup, and the first sip or two, I tasted some strong almond flavors and fittingly enough, cherries. After the nice beginning though, all hints of sweetness and subtleties disappeared off and what was left was very smoky. Perhaps I’m just being oversensitive, but I was disappointed how it finished. After finishing the espresso, I headed up the street toward Pike Place Market and my favorite store in Seattle, DeLaurenti. DeLaurenti is an Italian food import shop, and it seems like anytime I visit the city, I am drawn to the shelves full of Italian tomatoes, meats, cheeses, olives, pastas and wines. I can spend hours in that store, concocting recipes in my mind and dreaming about getting on a plane to fly to the Mediterranean. If I was going to get some more coffee, though, there was no time to linger, so I grabbed a sandwich and left quickly, to avoid falling prey to the temptations residing deeper within the store. Originally, I had hoped to go to Stella Caffè for some espresso (I had been thinking about it since my trip to Coffee Fest last October), but to my chagrin, the café that was rumored to have the best Robusta-based espresso in the city is no longer a café. I don’t know the story, but when I called to see what time they closed down the espresso bar, the woman on the other end informed me that they were now a bar and not a café. Foiled again. If anyone knows where I can get some of Stella’s stellar espresso, please let me know. 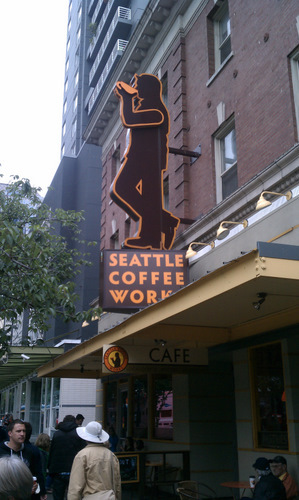 Instead of going to Stella, I walked up Pike Street to Seattle Coffee Works. Seattle Coffee Works is a small roastery/café located right across the street from the first Starbucks store. The café has a slow coffee bar on one side, with pourovers and vacuum pots, and on the other side it has an espresso bar. I chose the espresso side (surprise, surprise). The barista told me that although they usually had a single-origin espresso available, they had just run out of the Panama and were down to the Space blend, the café’s signature espresso. My impression was that it was just a bit on the tart side, but overall, much better than the espresso I had drunk a few minutes before. After downing the Space blend, I was feeling up for one more stop. Someone told me that Fonté was a nearby place that was doing good things, and since it was located between Seattle Coffee Works and the train station, it would be a great place to stop for the third leg of my trifecta. About five minutes later, I was seated at a table at Fonté, waiting for my cappuccino. Fonté has a pretty hip feel to it (like most places I regularly frequent*). In addition to being a coffee shop, it also doubles as a wine bar. It looked like a great place to spend a happy hour, so I was looking forward to my cappuccino. The foam on the cappuccino had a nice texture, but the espresso was roasted so dark that it completely overpowered the milk. A cappuccino should be balanced—both the milk and the coffee flavors should come through. In this cappuccino, though, you could not taste any of the natural sweetness of the steamed milk. The coffee dominated. It was too much for me. Visiting two cafés (out of three) that had super dark roast espressos left me disappointed but wondering, is this type of roast just the traditional “Seattle style?” Perhaps this is due to the influence of Starbucks in the city? Starbucks has a reputation for serving dark-roasted espresso, but its espresso doesn’t have as much of the smokiness as the espressos at Cherry Street, Fonté or Caffè d’Arte (another Seattle-based roaster whose espresso I have had in the past). Do I have the wrong expectations for what espresso ought to taste like? After all, I live in Portland, where lighter roasts are the norm. Should I learn to appreciate this dark roast for what it is, instead of thinking it should taste like something else, or are the beans being treated without the care they deserve? After yesterday, these questions linger in my mind. . . I would be very interested to hear what someone from Seattle has to say about this. 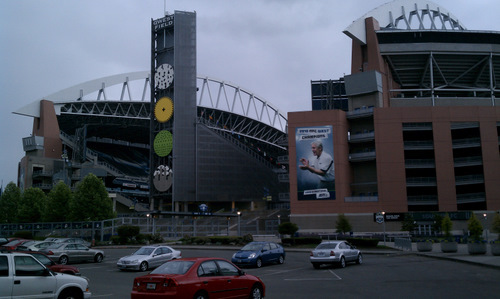 One of the stops I made was at Qwest (soon to be Century Link) Field, which is right next to the Amtrak station in South Seattle. It’s a nice looking stadium and it was humbling to walk right up next to the behemoth and look down on the field inside. I don’t know what it is about being up next to huge objects, but they make you feel small, especially when you’re not in a crowd of people. A stadium like that is a testament to human ingenuity. It doesn’t compare to standing next to Mt. Rainier, but I was still impressed. The city skyline, seen from the steps of the stadium. The Starbucks mother ship (corporate headquarters). I like the sirens rising out of the tower on top. 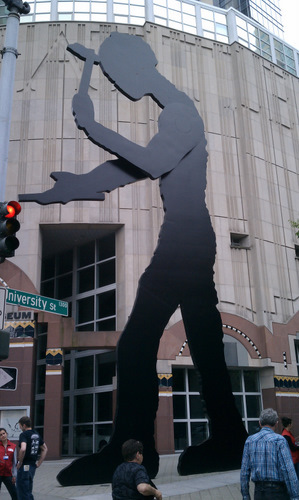 This statue was outside the Seattle Art Museum. One of these times I’m going to make it inside to see what treasures reside there. Overall, I enjoyed my trip to the Emerald City, and would have been content to stay for a little longer (there are several more cafés I want to check out). The train wouldn’t wait for me, though, so at 5:30 sharp, we pulled out of the station and headed south. Until next time, Seattle.